The former Deputy Governor, Central Bank of Nigeria, Professor Kingsley Chiedu Moghalu, has been confirmed as the keynote speaker at the 2018 edition of The Bullion Lecture, reports ITRealms. Professor Moghalu, currently the President, Institute for Governance and Economic Transformation, was until recently, Professor of Practice in International Business and Public Policy at The Fletcher School of Law and Diplomacy, Tufts University, United States of America. 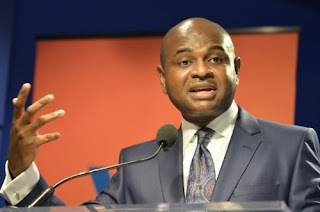 According to a press statement issued in Lagos by Ray Echebiri, Founder/Chief Executive Officer of Centre for Financial Journalism (CFJ Nigeria), Prof. Moghalu is a global leader who has made contributions to the stability, progress and wealth of nations, communities and individuals across such domains as academia, economic policy, banking and finance, entrepreneurship, law and diplomacy. “Moghalu will be speaking on The Wealth of Nations and the Imperative of Economic Transformation,” he said. Echebiri explained that The Bullion Lecture, is a platform conceptualised by Centre for Financial Journalism (CFJ Nigeria) for lively discourse on national and international issues, often delivered by first-rate academics and professionals. The 2018 edition, he said, The Bullion Lecture will hold 10am on Wednesday, March 21, 2018 at The Civic Centre, Ozumba Mbadiwe Road, Victoria Island, Lagos. The Lecture, he also said, will be chaired by erudite Lawyer and Economist, Senator Olabiyi Durojaiye, Chairman, Nigerian Communications Commission (NCC). Distinguished panelists who will dissect the lecture are Ms. Patience Oniha, Director General, Debt Management Office; Mr. Obinna Onunkwo, Managing Partner, Purple Capital; and Mr. Ade Adefeko, Vice President, Government and Corporate Affairs, Olam Nigeria. Expected guests at the lecture include government officials, captains of industry, the cream of Nigeria’s banking and finance industry, members of the diplomatic corps, representatives of multilateral institutions, senior media executives and other journalists, and members of the public.